A rice farmer is now contemplating his next move after losing over GYD$20 million in a fire suspected to be started by an arsonist gutted his two story wooden and concrete home Friday evening. 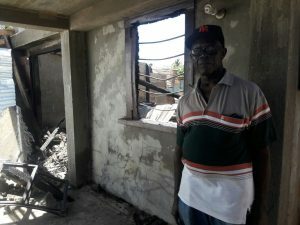 78-year-old Marvin Duncan of 135 A’ Mibicuri South, Blackbush Polder, Corentyne relayed to Demerara Waves Online that he was not at home at the time of the fire but was informed by his nephew. 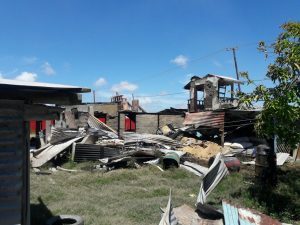 According to Duncan, who also owns a grocery in the bottom flat of the home, at around 7:39 pm, he and his wife were at Port Mourant attending a function when he received a frantic call from his nephew who informed him that his home was on fire. In denial that the house he has been residing in for the past 20 years was on the brink of being destroyed, he and his wife rushed to the scene only to be met with fire tender attempting to douse the flames. “My nephew call and say my house on fire and I seh boy you sure is my house and he said is my house on fire cause I didn’t want to believe. And is when we reach there, I see the whole place in fire”. According to the elderly man, along with $200,000 and a large quantity of gold jewellery, everything was destroyed in the fully furnished home. He estimated his total losses at GYD$25 million. Duncan stated that he suspected that someone set fire to his home, citing a recent court issue with his neighbour. He noted that they were placed on a bond to keep the peace but things were not peaceful. “We had a issue in the court and we had a bond to keep the peace but he still used to trouble me but I didn’t say nothing and now this happened”.